For the original stadium bearing the name, see Mountaineer Field (1924). Mountaineer Field at Milan Puskar Stadium (commonly known as Mountaineer Field or Milan Puskar Stadium) is the football stadium for the West Virginia Mountaineers NCAA Division I FBS football team. 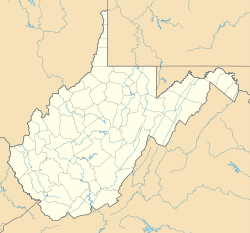 The stadium is located in Morgantown, West Virginia, on the health sciences campus of West Virginia University. The seating area of the facility was renamed "Milan Puskar Stadium" in 2004, after a $20 million donation to the university by Morgantown resident and founder of Mylan Pharmaceuticals, Inc., Milan Puskar. The original Mountaineer Field was located on the school's main campus, but it could not be expanded or modernized due to the proximity of campus buildings and roads near the stadium. It seated 38,000 when it was last used in 1979. The new stadium was originally to be called Mountaineer Stadium, but the fans ignored this and called it New Mountaineer Field, with the "new" eventually falling into disuse. Mountaineer Field was constructed in 1980 on the former site of a golf course between the Law School and Medical School buildings. The stadium's original cost was $22 million. Upon completion it had a seating capacity of 50,000. The stadium was expanded in 1985 with 7,500 seats added to the south end zone for $6.5 million. In 1986, 6,000 seats were added to the north end zone for $650,000. In 2004 the existing north end zone seats were removed, and luxury suites were added at a cost of $13 million. The most recent expansion actually reduced the seating capacity by 3,500, so the official current capacity is 60,000. In summer of 2007 approximately 500 seats were added in the corners of the north end zone and above the weight room in the south end zone and the field received new turf. There are five banks of lights located on the perimeter of the stadium and one long bank along the top of the press box. There are 12 luxury seats on the first level of the press box, 18 in the north end zone, and 648 club seats in the north end zone called "Touchdown Terrace". The field surface was once again replaced in 2016, to remove the crown on the field, which was used for water drainage, but is not needed anymore due to the type of turf that is being used. Mountaineer Field has occasionally hosted larger crowds than its listed capacity; the current attendance record was set on November 20, 1993 when 70,222 fans packed the stadium to watch the #9 ranked Mountaineers defeat #4 Miami. Mountaineer Field has also hosted non-university football games in the past. 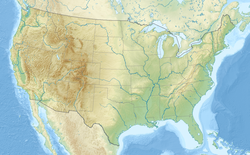 One notable game was a National Football League pre-season game on August 22, 1998 between the Pittsburgh Steelers and the Atlanta Falcons. Old Mountaineer Field had also hosted an exhibition game in 1968 between the Steelers and the expansion Cincinnati Bengals of the American Football League. Morgantown's two public high schools, Morgantown and University, used to share a stadium and play their annual rivalry game at Mountaineer Field. With the opening of University's new field in 2008 the game has been moved to rotating a series between the two schools. The stadium also hosted the 1988 WV high school football championships. When Mountaineer Field was dedicated on September 6, 1980, which also marked the first game for head coach Don Nehlen, fans were surprised when singer John Denver made an appearance and led the fans in the singing of his hit song "Take Me Home, Country Roads". The song has been played at every Mountaineers home game since 1972. In recent years, the song has been the subject of a new tradition; after a Mountaineers win, the players lead the crowd in singing the song. The Stadium has also played host to regional Drum Corps International and Bands of America events, as well as many local high school band festivals. Going into the 2007 football season, the stadium turf was changed from the AstroPlay surface installed in 2002 to the more popular FieldTurf surface. The cost was estimated to be near $1 million. The turf was ready in time for the fall 2007 season, even after the endzone sections had to be replaced because they were the incorrect shade of blue (too light). Along with the new turf, additions to the touchdown terrace on the north end zone were made. Construction to completely enclose the terrace and add 180 more seats were also finished before the start of the season. During the summer of 2008, the WVU Foundation partnered with Panasonic to install a new video scoreboard at the stadium. The scoreboard has a screen three times wider than the previous one and features a higher resolution. Additionally, a 306 ft fascia LED panel runs the length of each sideline. Locker room renovations were done prior to the 2013 season. Additional improvements were announced in the spring of 2014, including a new team meeting room, improved stadium concourse, and renovated concessions. Thanks in part to the university's media agreement with IMG, prior to the 2014 season four new LED boards were installed in each corner of the stadium at field level as well as updated auxiliary scoreboards in both the North and South end zones. To round out the most recent set of updates, graphic banners now adorn the stadium's old grey walls both at field level and along the upper deck. In late Spring of 2015 work began on approximately $55 million in renovations to Milan Puskar Stadium and Mountaineer Field. The old turf and goalposts were not only replaced, but the large crown under the field—one of the steepest still remaining in college football—was removed, a modern drainage system was installed that is more in keeping with today's infilled artificial turf systems, and a Brock PowerBase shock pad was laid down. The FieldTurf Revolution surface was completed for the 2016 season and featured a larger "Flying WV" logo at midfield. Northeast gate with new ADA accessible elevator and covered areas. The new northeast gate, Mountaineer Mantrip Route, and "Legends Park" were finished in late Summer of 2016. Work on the east side gates and concourses, including renovations to concessions, restrooms, new elevators/ADA accessibility, upgraded box seats, graphics, charging stations, and new audio/video systems were completed in 2016, while a new "Legends Park" honoring past Mountaineer greats in an expanded greenspace on the north end of the stadium was also added. 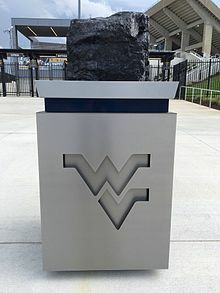 A new route for the pregame "Mountaineer Mantrip" tradition was incorporated into the northeast gate, which included a large block of coal in remembrance of the Upper Big Branch mine disaster that was placed on a decorative pedastal for players, coaches, and fans to touch on their way into the stadium. A mirror image of the east concourse will be done on the west side of the stadium in time for the first home game of the 2017 season. The block of coal from the Upper Big Branch mine disaster was incorporated into the northeast gate renovations as a part of the "Mountaineer Mantrip" route in 2016. A large new video board, measuring approximately 98 by 38 feet (30 by 12 m), will be added to the north end of the stadium above Touchdown Terrace and the north endzone suites in the summer of 2017. It will provide an additional viewing experience for fans to compliment the existing board in the south end of the complex, while upping the viewable square footage by almost 86% in comparison. The south end board will be replaced and a new surround sound system will be installed throughout the seating areas at a later date TBA. Another new field-width LED ribbon board will also be installed above Touchdown Terrace along with the new video board in 2017. Renovations to the east concourse were completed in 2016. The new Southeast Gate at Milan Puskar Stadium. A new "Legends Park" was added to the north end of the stadium. ^ a b "2013 West Virginia University Mountaineers Football Media Guide". West Virginia University Athletics. p. 35. Retrieved February 18, 2014. ^ "Jay to Take Part in MU Groundbreaking". Williamson Daily News. May 5, 1979. Retrieved October 6, 2011. ^ Bogaczyk, Jack (August 21, 2008). "WVU considers adding suites to Puskar Stadium". Charleston Daily Mail. Retrieved September 9, 2009. ^ "Huntley helps Steelers run past Falcons 28-22". Associated Press. August 23, 1998. Retrieved October 3, 2014. ^ "Bengals topple Steelers, 19-3". Associated Press. August 25, 1968. Retrieved October 3, 2014. ^ "New Graphics Give Mountaineer Field a Facelift for 2014". statejournal.com. Retrieved 26 September 2014.